For the first six months of the year, members exchanged flying geese blocks. Each month we were to bring a certain amount of geese, made from modern Kona colors with gray backgrounds. Some of us participated every month, and some of us only participated a few times. But no matter how many blocks you had, all the reveals were amazing and unique! I think that the statement heard most was, “I can’t believe how different everyone’s reveal is…” And it’s true! See? So many unique, beautiful interpretations! provided a practice run—and it was practice for both the quilters and herself. She judged 35 member quilts as part of the process to become a certified quilt judge. Tina provided feedback on each quilt and awarded "ribbons" for best in several categories. She explained how judges approach each quilt, what they look for, and how they score the quilt's design and technical presentation. She also answered many questions from members. Since the library closes at 1 p.m. in the summer, there will be no regular meeting in July. 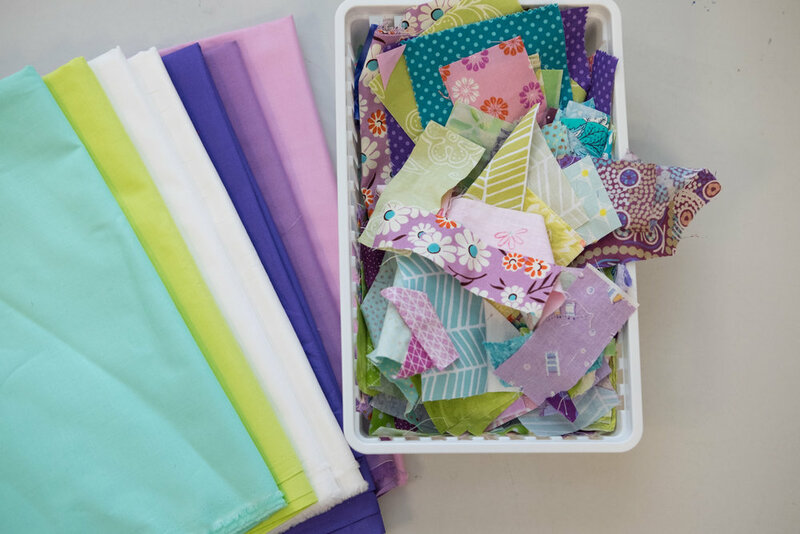 Open Sew will be held from 9:30 a.m. to 12:30 p.m. in Hayden Center Room 3. Sue Ahnrud will lead a workshop on making improv name tags for anyone who would like to participate. The August meeting will be a summer picnic! Time and place to be announced. 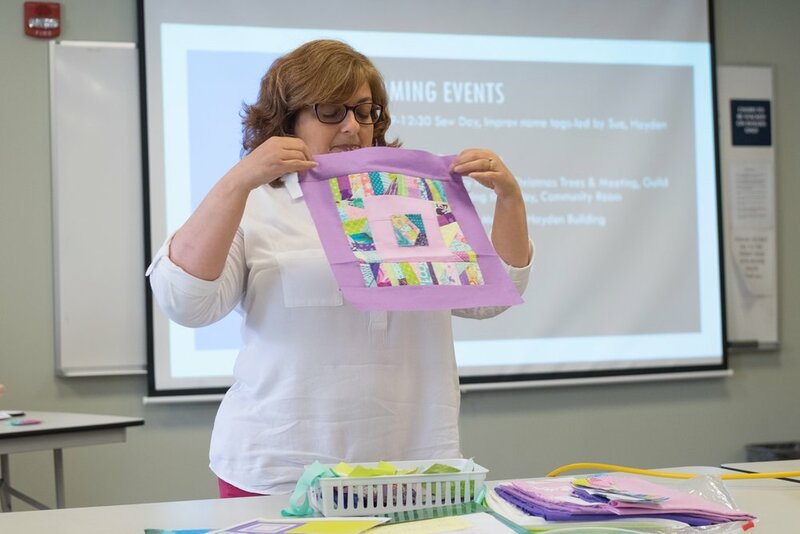 Members were inspired to organize their sewing spaces with Denise Lamb's presentation that was chock-full of ideas and tips. Denise, a professional organizer, shared dozens of photos of spaces she has organized for clients as well as ideas for furniture, storage containers and design walls, even upcycling everyday containers like plastic lettuce boxes. Her presentation was a real treat. 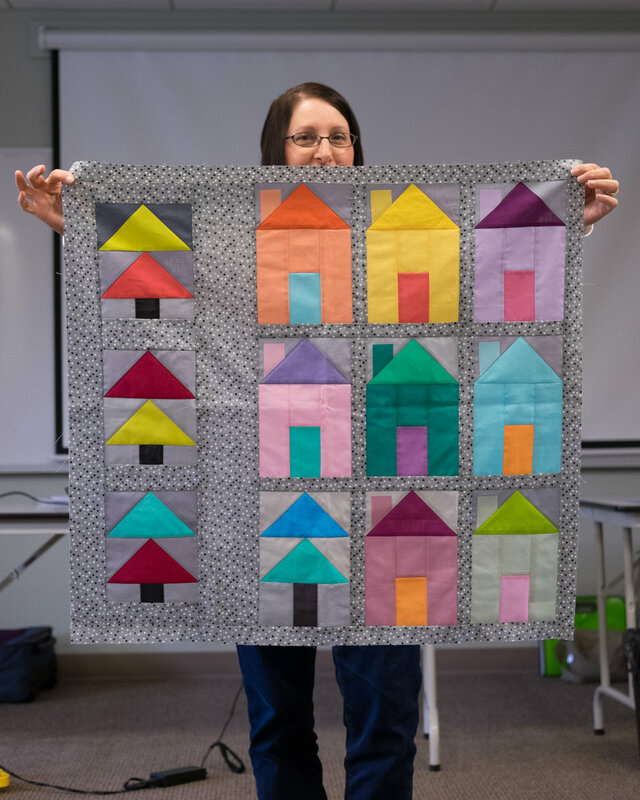 At the April meeting, member Maria Lage demonstrated her technique for framing small quilt tops. She brought many samples to show, and all were stunning. We saw many beautiful new quilts during the show & tell part of the meeting.